Asbestos is a mineral fiber found in rocks, of naturally occurring silicate minerals that can be separated into fibers. Asbestos can be found in Tampa area homes in a variety of forms. There are several kinds of asbestos fibers, all of which are fire resistant and not easily destroyed or degraded by natural processes. The fibers are strong, durable, and resistant to heat and fire. They are also long, thin and flexible, so that they can even be woven into cloth, because of these qualities, asbestos has been used in thousands of consumer, industrial, maritime, automotive, scientific and building products. During the twentieth century, some 30 million tons of asbestos have been used in industrial sites, homes, schools, shipyards and commercial buildings in the United States. There are several types of asbestos fibers, of which three have been used for commercial applications: (1) Chrysotile, or white asbestos, comes mainly from Canada, and has been very widely used in the US. It is white-gray in color and found in serpentine rock. (2) Amosite, or brown asbestos, comes from southern Africa. (3) Crocidolite, or blue asbestos, comes from southern Africa and Australia. Asbestos has been shown to cause cancer of the lung and stomach according to studies of workers and others exposed to asbestos. There is no level of exposure to asbestos fibers that experts can assure is completely safe. Some asbestos materials can break into small fibers which can float in the air and these fibers can be inhaled. The tiny fibers are so small they can not be seen with the naked eye. They can pass through the filters of normal vacuum cleaners and get back into the air. Once inhaled, asbestos fibers can become lodged in tissue for a long time. After many years cancer or mesothelioma can develop. Are All products With Asbestos A Health Risk? No. A health risk exists only when asbestos fibers are released from the material or product. Soft, easily crumbled asbestos containing material has the greatest potential for asbestos release and therefore has the greatest potential to create health risks. Do All People Exposed To Asbestos, Develop Asbestos Related Disease? No. Most people exposed to small amounts of asbestos do not develop any related health problems. Health studies of asbestos workers and others, however, show that the chances of developing some serious illnesses, included lung cancer, are greater after exposure to asbestos. What is common to many asbestos-containing products is that they were (are) used to contain heat (i.e. thermal insulation.) This was the main reason for their use. It is impossible to list all of the products that have, at one time or another, contained asbestos. One of the most common products asbestos is found in, is in the insulation material found on heating pipes and ducts of homes built before 1960. Some of the other common asbestos-containing products are insulating cement, insulating block, asbestos cloth, gaskets, packing materials, thermal seals, refractory and boiler insulation materials, transite board, asbestos cement pipe, fireproofing spray, joint compound, vinyl floor tile, ceiling tile, mastics, adhesives, coatings, acoustical textures, duct & pipe insulation for heating, ventilation and air conditioning (HVAC) systems, roofing products, insulated electrical wire and panels, and brake and clutch assemblies. How Can I tell If I Have Asbestos In My Home? People who have frequently worked with asbestos (such as plumbers, building contractors or heating contractors) often are able to make a reasonable judgment about whether or not a material contains asbestos on a visual inspection. Many professional home inspectors also can make a reasonable visual judgment. To be absolutely certain, an industrial hygienist would have to make the identification. Asbestos is a tiny fiber that was used in the past primarily as insulation in building construction. It was also added to some building construction materials to provide added strength and flame resistance. We have since learned that the problem with asbestos is that there is documented evidence that it can cause lung cancer and mesothelioma in individuals who were exposed to large amounts of free-floating asbestos fibers in the air, within homes and other buildings. Reported medical conditions did not become widespread throughout the public until about 3-decades after the exposure. Because of the potential health hazards of asbestos fibers, its use in insulation and paint was banned in the 1970’s. 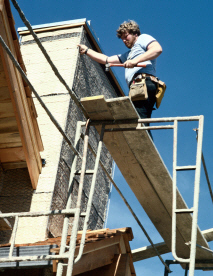 Homes constructed prior to the 1970’s may contain asbestos fibers in insulation, plumbing, paint, wall joint compound, and other building materials. However, as long as the materials are in good condition, and particularly if they are enclosed or at least partially encapsolated, they pose minimal danger. Asbestos is normally only a threat if the fibers are released into the air and can be inhaled. Renovations or demolitions of building materials containing asbestos can release the fibers into the air. Therefore, the National Emissions Standards for Hazardous Air Pollutants (NESHAP) requires the owner of any property containing asbestos building materials to get an asbestos inspection prior to any demolitions or renovations of that property. If your home contains asbestos fibers, you have 2 options: complete removal of the material or sealing the material to prevent it from releasing fibers. Either option requires the help of a licensed contractor, trained in asbestos handling and remediation. How would I know if my home contains asbestos? If you suspect your home or a home you are considering buying may contain asbestos, it’s vital you get a thorough inspection by a certified inspector. Asbestos can only be detected by a special microscope. Some inspectors are trained in asbestos detection and may be able to take samples from your home for further laboratory analysis. Please contact your inspector for further information. Vermiculite is a naturally occurring mineral that may contain asbestos. Vermiculite has the unusual property of expanding into worm-like accordion shaped pieces when heated. The expanded vermiculite is a light-weight, fire-resistant, absorbent and odorless material. These properties allow vermiculite to be used to make numerous products, including attic insulation, packing material and garden products. Asbestos contamination in vermiculite and vermiculite products has become a national concern. A tremendous amount of information has been made available to the public via print, television/radio and the Internet. EPA's vermiculite pages provide users with basic information about Vermiculite and its uses, factsheets, Question and Answer documents, reports, and links to EPA Regional vermiculite pages. EPA, in conjunction with Agency for Toxic Substances and Disease Registry (ATSDR) and National Institute for Occupational Safety and Health (NIOSH), has launched a national awareness campaign to arm homeowners with important information on vermiculite attic insulation. If Asbestos Is Found In My Home, What Should I Do? In most cases, asbestos containing materials are best left alone. When it is necessary to disturb asbestos, you should contact a licensed asbestos contractor. You can also obtain a copy of Asbestos in the Home published by the U.S. Consumer Products Safety Commission (800-638-2772) which discusses the situation and makes recommendations. Remember, do not dust, sweep, or vacuum particles suspected of containing asbestos fibers.